Many residents of Imperial Beach prepared their waterfront homes for potential flooding during the king tide event Monday. 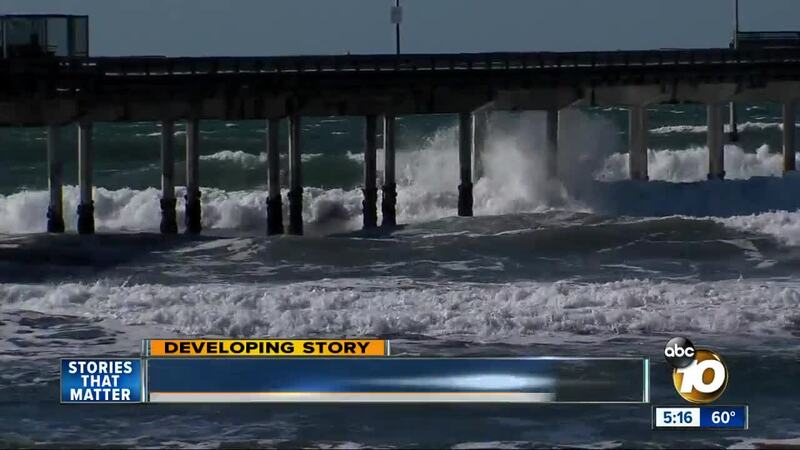 SAN DIEGO (KGTV) - Many residents of Imperial Beach prepared their waterfront homes for potential flooding during the king tide event Monday. Minor flooding was expected in low-lying coastal communities. Imperial Beach resident Vanessa Stewart lined her home on Seacoast Drive and Cortez Avenue with sandbags, as did many of her neighbors. “Our Mayor Serge kind of keeps everybody posted about what's going on in Imperial Beach and kind of told us be really careful,” she said while watching the high surf from her deck. The king tides reaching up to seven feet brought out spectators to witness mother nature in full force, but it also came with potential dangers when some got too close. “That man and the little boy were standing there and I was like, ‘what are you doing?’ They’ve got to realize that mother nature is really crazy, you just got to be really careful,” said Stewart. She has lived at her home on Seacoast Drive for five years and says the high surf is something she’s used to. Crews spent Monday morning shoveling mud out of the flooded streets and working on storm drains. When 10News was in Imperial Beach several weeks ago when homes were flooded due to high surf, a scientist with the Scripps Institution of Oceanography was at the south end of Seacoast Drive conducting a study about the combination of waves and tides that leads to these flooding events. “We have sensors out in the water measuring offshore waves,” said Mark Merrifield with Scripps Institution of Oceanography. “Waves as they come to the shore and the flood as it happens around the street here. Stewart said the scientist played a big role in making sure everyone would be safe and able to prepare for the king tides.